Henry Chalfant is the co-producer of Style Wars , the acclaimed documentary of the old school graffiti and b-boying scenes, and the co-author of the groundbreaking graffiti books, Subway Art and Spraycan Art . Henry Chalfant (born January 2 , 1940 in Sewickley, Pennsylvania ) is a well known and highly regarded urban culture photographer and videographer most notable for his graffiti and breakdance photography and film . His photos are in the collections of the Metropolitan Museum of Art in New York City , and the Carnegie Institute in Pittsburgh, Pennsylvania . A graduate of Stanford University who majored in classical Greek , He has co-authored the definitive account of New York graffiti art, Subway Art and a sequel on the art form's world-wide diffusion, Spray Can Art . 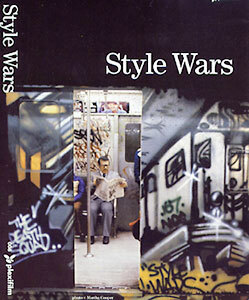 Chalfant co-produced and did the background research and photo-documentation for the film, Style Wars , first shown on PBS television in 1984 . One of the foremost authorities on New York subway art, he has published articles and lectured extensively on urban culture. More recently he has lectured on the aspects of conflict in the Middle East , in particular the Israeli occupation of Palestinian territories .